Synopsis: A young British ski jumper has aspirations of going to the Olympics, finds his calling as a skier and harbours dreams of representing his country at the Winter Olympics. Review: Everyone loves an underdog story, particularly when it comes to sport especially here in Britain given our questionable record when it comes to a handful of top international sporting tournaments. What’s more, everyone loves a story of one man pursuing his dream with seemingly every obstacle thrown his face and being ridiculed time after time, but no matter what, they keep on going. In the case of Michael “Eddie” Edwards AKA Eddie the Eagle, this is certainly the case as he stops at nothing to try and achieve his dream of becoming an Olympian, even it means making a fool out of himself in the process. Fresh from his successful break out role in Kingsman: The Secret Service, along with a very humorous turn in the Kray brothers drama Legend, Taron Egerton really shines as the titular character. He is a bit of a dork, but at the same time he’s very sincere and genuine. What’s more, his indomitable spirit and desire to achieve his dream just make you want to root for him and will him to success. Aiding him on that quest is his fictional coach Bronson Peary, played by Wolverine himself Hugh Jackman. Haunted by his past in the sport, he decides to coach Eddie and himself becomes determined to do everything he can to help Eddie achieve success. The two actors make a formidable duo and it is their friendship that drives the movie forward. Of course the writers did take liberties with the story, but at the core, it’s a powerful true story. The ski jumping scenes themselves are executed very well with some tremendous camera-work that shows the jumps from the jumper’s perspective,and that might just make anyone watching to never wish themselves to be in that position. Visually these scenes are excellent and the cinematography is tremendous. When Eddie is perched on the top of those ramps, the tension is kicked up a notch as you will him to succeed. The plot is a bit formulaic as we have seen many other sport movies where an underdog triumphs in the face of adversity. It is a very by-the-numbers story, and it could have gone into more detail in places, but at the same time it is tremendously uplifting with a great feel good factor. Due to Eddie’s spirit and unwavering desire to succeed, you can’t help but smile by the time the credits begin to roll, and makes you think you can go and follow your dream yourself, even if time after time, obstacles keep blocking your road, or in Eddie’s case, his path to a frighteningly high ramp. 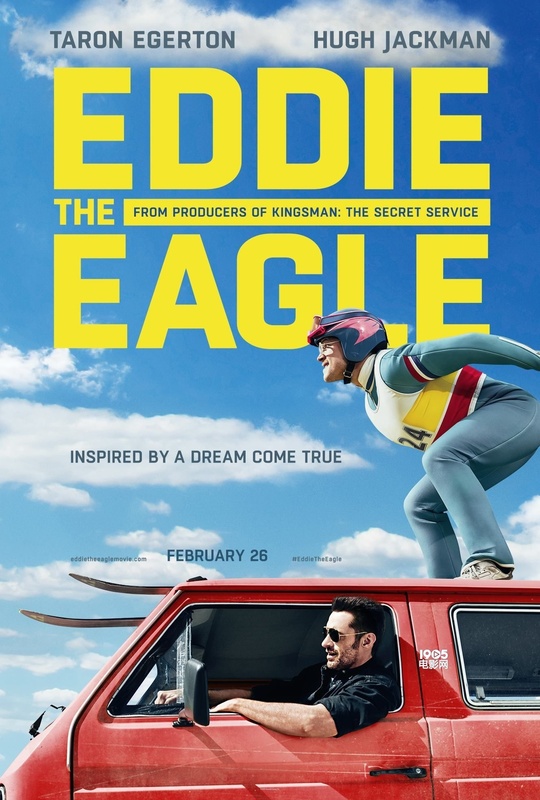 The plot is very by-the-numbers, but two very sincere performances from Jackman and Egerton, with enthralling jump sequences, mean Eddie The Eagle soars.